Agnes Pelton, Return, 1940, oil on canvas, 30 x 26". You can nearly hear the clean, spirited chime of the lemon-yellow bell at the top right corner of Agnes Pelton’s roughly three-by-two-foot painting Voyaging, 1931. That bell might be calling to a lighter yellow chain to the left, attached like a lure to what loosely resembles the wisp of a plant. All of this hovers above a dark-blue opening in the foaming green waters of some kind of supernatural tide pool. Or is it a mountain range? 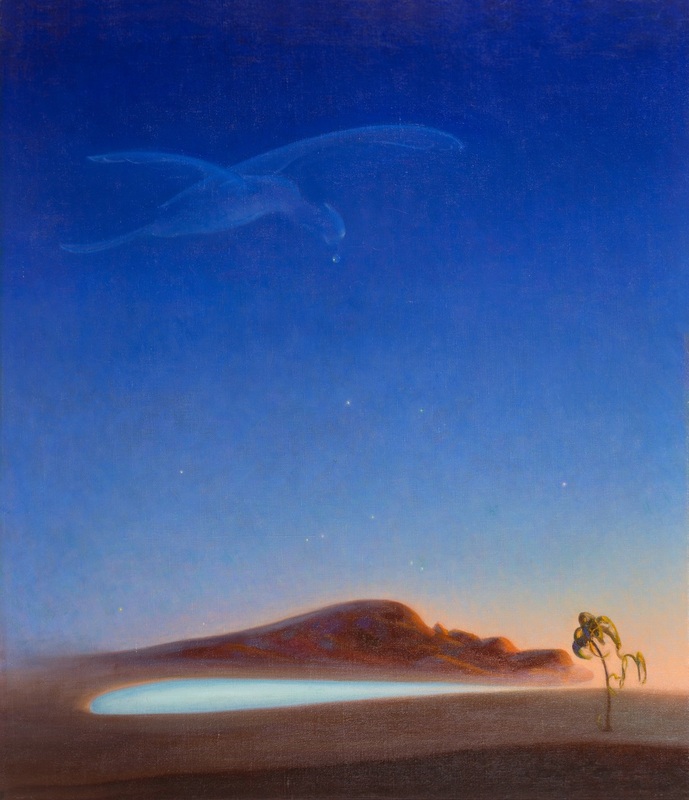 Return, 1940, shows a giant ghostly primordial bird contemplating its reflection in a shimmering mirage-like pond. The creature is magnetic, pulling in a wayward tree, tractor-beam style. The rounded desert topography and almost-glowing light of these canvases are characteristic of Pelton’s work at her peak, around the time she moved from New York to Cathedral City, California. She easily integrated personal symbology into formal, vertical compositions opening into vast, trance-inducing skies. Her easel paintings were informed by her readings of Carl Jung, Theosophy, and Agni Yoga, and also by her studies with Arthur Wesley Dow, painter of flattened and idealized natural scenes. But Pelton’s works don’t feel overburdened with reference; their primary influence seems to have been the artist’s own abstract, spiritual, hallucinatory imagination. The markmaking is spontaneous and robust, the pictures cosmic and elusive. Notably, this exhibition, which will travel the United States, positions Pelton as one among many overlooked and undertheorized women artists. (Her 1995 retrospective at the Palm Springs Desert Museum made a similar claim.) In an essay in the accompanying catalogue, art historian Susan Aberth places Pelton in a “trajectory of women artists,” including Remedios Varo, Georgiana Houghton, Hilma af Klint, Emma Kunz, and Juanita Guccione, who were on a “quest to capture the esoteric.” Only now, posthumously, are they being recognized for their pursuits.